Sunday I finished my eleventh marathon, my first in over two years. As forecasted, the weather was cold at the start. Many runners were shivering in the starting chutes. Fortunately for me my son Jonathan came to support me and took my warm-ups a few minutes prior to the start. I even took one shirt back after tossing it to him. Cold muscles do not function well. Later at mile five I handed him my gloves, ear band and warm-up shirt, finally warm enough to run comfortably in shorts and t-shirt. 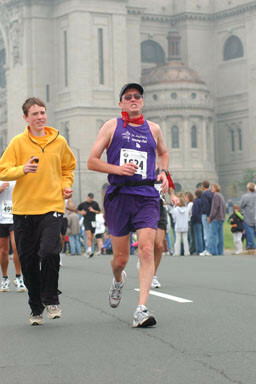 The marathon has sometimes been described as a twenty-mile warm-up and a six-mile race. By mile twenty the leg muscles are often depleted of glycogen and overall fatigue sets in. The description is especially appropriate for the Twin Cities Marathon, since after mile twenty the race course climbs out of the Mississippi River Valley towards the hills by Macalester College and St. Paul Cathedral. Through mile twenty my race had gone well with no big surprises. I did discover that I did not need to drink as much Powerade as I had during hot summer runs. Fortunately there were plenty of porta-potties along the way. I also discovered that I had not practiced enough specific pace workouts, in which I practice running the specific pace I planned for the marathon. I wanted to run 8:46 mile pace, but as I checked my watch at each mile I learned that I did some miles in 8:20 and some at 9:15 (stops at porta-potties did not help). As I have written before, each marathon has something new to teach me. At mile twenty, the real challenge began. My legs, especially my hamstrings and quadriceps became heavy and sore. My run became more like a fast shuffle. As I approached the hill at Summit Avenue my pace slowed. My lofty goal of 3:50 had already slipped away and my secondary goal of 3:55 (my Boston Qualifier) was in doubt. But that is when helped arrived. My son Jonathan met me at mile 21 to run the last 5.2 miles with me. He has done this in my past two marathons when I had really struggled at the end and had to walk a lot. This time his strong words of encouragement and support kept me moving forward at a 9:20 pace. He reminded me that “This is the day the Lord has made, let us rejoice and be glad in it” (Psalm 118:25) and “The joy of the Lord is our strength” (Nehemiah 8:10). Though I felt this overwhelming urge to walk I knew that my goal of 3:55 was in doubt and any walking breaks would kill it. We powered on. At mile 22 I heard above the many cheering spectators the loud strong voice of Tim Torgerson as he bicycled the course, shouting encouragement to me and others. “Relax your jaw, keep your arms pumping, stay strong.” He would not let me stop, but pushed me to do my best. I am reminded of Hebrews 12:1-2 where the writer reminds us of “we are surrounded by so great a cloud of witnesses and let us run with perseverance the race that is set before us.” In the preceding chapter the writers highlighted the heroes of faith in the Old Testament that now cheer for us in our race to Jesus. I felt like Jonathan and Tim were my own unique witnesses who gave me the specific words I needed to accomplish my task. As I pushed the final mile to the finish line, I knew it would be close to 3:55. As I stopped my watch, it read 3:53:53. I had finished with 1:07 to spare. * I had my BQ! 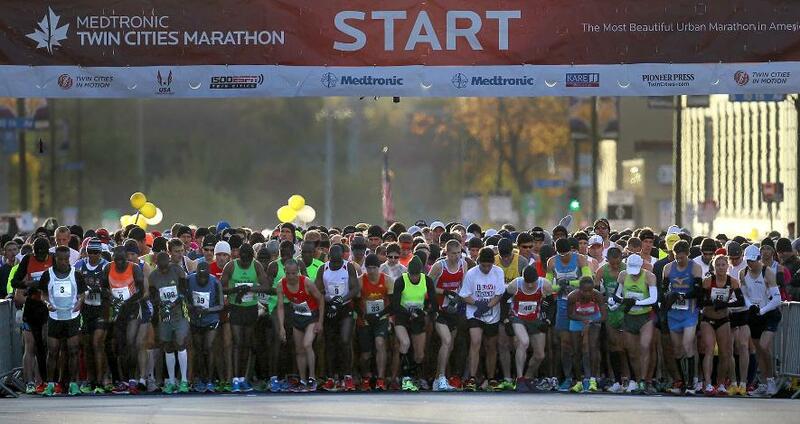 A decade-old dream of running the oldest, perhaps most prestigious marathon is now possible. My next challenge will be to prepare well and to stay injury free for the Boston Marathon in April, 2014. I just hope I have a similar cloud of witnesses that day. Lord Jesus, thank you for being with me in the challenges of life. *My official chip-time was 3:53:54. I must have been a little fast with my watch. This entry was posted in Body Mind Spirit, Jesus, mental exercise, Physical Exercise, spiritual exercise, Uncategorized and tagged cloud of witnesses, Hebrews 12, marathon, Twin Cities Marathon on October 8, 2012 by Pastor John Keller. So proud of you! Can’t wait to cheer you and Jonathan on at Boston in 2014!!! Congratulations on doing more than you ever thought you could do!! Can’t wait to cheer you on in Boston!! Running (marathon-training in particular) provides a wealth of life lessons and blog material. Glad to know you earned a Boston spot – and we can look forward to miles of insights in the future. That image of 1:07 to spare strikes me as an image for so many situations in the Christian life where God’s power, or angels, seem most evident, or timely, in the home stretch. Way to go and stay strong at the end….Congratulations! Great work John. I am a running dork so I love to hear running stories. One of my favorite things to do is chat with my fellow runners after a run. My half is at the end of the month. 8 miles on Sun after church at an all in 7:59 pace. Fastest ever. Love that Jonathan finished with you. You are blessed in so many ways. PTL! Congrats John on a great race and for qualifying for the Boston Marathon!!! You were truly blessed by wonderful family and the Lord to help you acheive your goal. Your comments about Jonathon running with you at the end brought tears to my eyes. Congratulations on a great finish! What an accomplishment.